Coldwater fish species such as coho salmon and rainbow trout are increasingly threatened as climate changes and temperatures rise. They must adapt, migrate or face extinction. But freshwater fish can only migrate so far; they are bound by river corridors, barriers and physical conditions (salt water tolerance, temperature, etc.). Spring-fed rivers and streams are becoming more important for cold-water fish species because the water volume and temperatures in these systems are more resilient to variation in precipitation and climate change than surface run-off watersheds. Spring-fed rivers will act as cold-water refuges for these species as climate changes and surface water-fed rivers run low and warm. The underlying geology of a river is one of the most important factors in determining whether a watershed will be more resilient to climate change by maintaining cold water for cold-water species. Water chemistry is another factor that contributes to ecological productivity, particularly in a spring-fed system. Underlying rocks can contain nutrients such as nitrogen and phosphorous, common nutrients in spring waters and critical for a robust aquatic food-web (Jeffres et al. 2009). 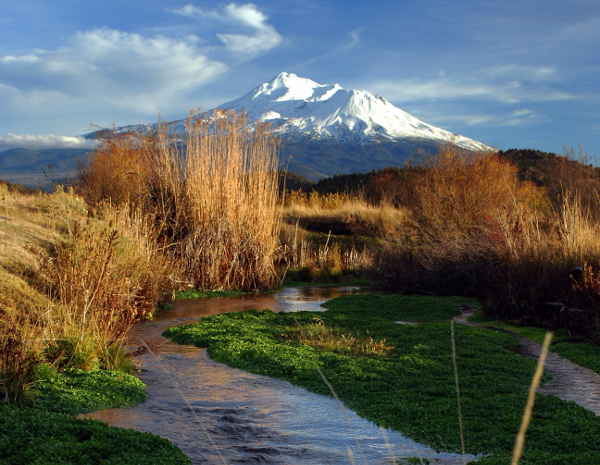 The UC Davis Center for Watershed Sciences has taken a multi-disciplinary approach to studying spring-fed systems. Spring-fed systems are a prime example of physical conditions driving the aquatic biota, and as such provide a unique opportunity for a synergism between various research groups. Areas of research include: geology, geomorphology, water quality, hydrology, vegetation, invertebrates and fish. By researching all of these areas, a complete story of spring-fed systems can be assembled.